Though the video will be posted soon enough, I wanted to share the transcript from my talk at NCTM’s Shadowcon in San Antonio. Hope you find it meaningful to read in addition to listening. Like many young girls, I excelled in school math; unlike some older girls, I studied Electrical Engineering and Computer Science; and then like fewer women, I continued to graduate school in the field. Though 20% of my undergraduate department were women, most of my graduate classes consisted of just me and well, a sea of dashing men. The participation and achievement of female students in K-12 math and science are on par with male students, but then something mysterious happens and female participation in post-secondary fields diminishes to 25% in the mathematical sciences and 15% in engineering. As an urban educator, my main focus has been to close the achievement gap for our students from historically underserved communities, so this statistic has caused me pause and wonder – even if we close the achievement gap for our most vulnerable students in K-12 Math today as we’ve done for our female students, will we see similar drop-offs in post-secondary STEM? And if so, what can we do about it? I acknowledge that unsupportive environments in higher ed and the workplace do play a heavy hand in these outcomes, today, I’d like to focus on what we as the K-12 Math community can do to foster equitable participation across all fields of study, irrespective of a student’s background. Like many of you, my stake in this work is personal and can somewhat be blamed on my DNA. My grandmother was the first female graduate of her university in a city outside the bustling metropolis of Calcutta in India. It’s hard to imagine looking at these nice fellows in her alumni reunion photo but she endured daily threats to her physical safety and dignity to pursue her bachelors degree in Philosophy in 1942. This was also the closest that a woman could get to math in that time and space. Her daughter, my aunt, went on to pursue her study of Architecture and Urban Planning at the Indian Institute of Technology in 1977, and her alumni photo, actually taken this year, is emblematic of her own generational story of “being the first”. My mother’s experience was pretty similar as well, and she studied engineering here in the U.S. Following the journeys of the many women in my family, I started a life-long internal journal collecting the qualities of “generational firsts” as I call them. People who didn’t veer course despite subtle and overt threats to their presence in a dominant culture. And it turns out, I noticed a common thread – an unyielding heart, within which their senses of morality, purpose and a courage to voice their ideas, lived. It was a deep emotional resonance with their chosen fields. It was their mathematical hearts. We’ll explore this more in just a moment. Why don’t the Humanities see this level of drop off after high school for historically disenfranchised students and are there any commonalities between these reasons and the qualities of “generational firsts” that I observed? I was particularly struck by this in my first year of teaching in the Boston Public Schools. I was preparing for a lab day on Newton’s 3rd law, and next door, I heard chaos. It turned out that students were given a letter when they walked into class that told them due to budget cuts, students had to start paying for paper. They were going to learn about the American revolution that day, and couldn’t join the class until they paid $0.25/page/person. Some kids reached into their pockets, some looked around sheepishly to borrow, and some were simply angry. This lesson on taxation without representation inspired a charged discussion about students’ inherent values around liberty and what means to them, and moreover what adequate representation in our government should look like to honor that liberty. While I watched my colleagues build strong emotional and intellectual resonance with their content, where my students could discover what they valued, what felt important to them, shun conventional wisdom if appropriate, invoke their evolving moral compass to make decisions about the issues of today and tomorrow, I was reminded, these were reactions that we as Math teachers didn’t get to see as often as our Humanities counterparts. My music and arts colleagues achieved similar connections to self, though the type of connection varied. In the case of music, it’s easier because there is an actual resonance between frequencies in our bodies and those found in various pieces of music. But all of this helped me to see more clearly – that as a math community of researchers and practitioners, we’ve grappled with and made significant progress in identifying equitable teaching practices that develop mathematical thinking or the mathematical mindsets of students. But what about their mathematical hearts? I submit, that there is an underrepresented element in our narrative, which may be a key ingredient for many of our more vulnerable students. An explicit effort to humanize mathematics. In essence, this is an effort to enhance the domain of k-12 math itself to be more inclusive of the many sensibilities our students seek to understand through their education. So what could this look like in our math classrooms? And what are some practices we may already use, but can wield with greater intentionality? In other words, create a space for students to identify and grow what is important to them. Personally, I think it’s hugely important to engage in questions of the future, rather than an emphasis on the past and present. After all, the future belongs to those who can change it. And many of our students from underrepresented populations simply haven’t had as much time to think about their ideas of the world as they’d love to see it. Governments in the future might look to assign a score to each citizen based on their “trustworthiness” (China is looking to implement such a scheme). That score would determine your rights a person – whether you can skip lines at the hospital, what schools you can attend, whether you have access to good jobs/welfare/SS, whether there will be more or less frisking at the airport etc. So what does it mean for a person to be trustworthy, and what indicators should go into determining this score for a person? Should it be a weighted sum, or should it be calculated in a different way? What are the benefits and drawbacks of this scheme in the short term and long term? For younger students, instead of a political connect, it could be presented as a school-wide initiative that awards privileges to students based their scores. If school-wide schemes feel fair, why not a national one as well? It may turn into a mathematical discussion of George Orwell’s 1984, but I’d argue a worthwhile one given the turn of governments around the world. 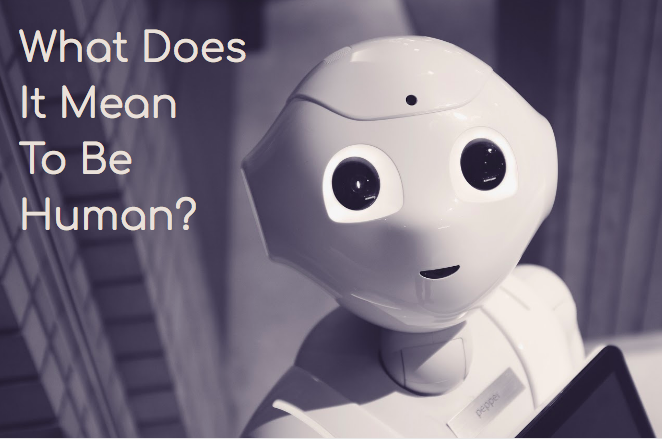 Automation may begin to take over more of our industries, and as we continue to learn how to program robots to behave like humans, we’re confronted with the question: what does it mean to be human? For example, imagine you’re programming a driverless car. The car reaches a situation where it must swerve and will either hit a renowned biologist, about to find the cure for cancer, or two families, with children. How could such a decision be made? As students explore the impact and morality behind each decision, they would have to employ various modeling tactics to make this very dreadful choice. But it’s a choice that mathematicians with heart may be making in our future. As you can see, these examples — engage students in some of the pressing questions of our time, by offering them a space to explore what they value on a variety of topics, and then use mathematical tools to implement ideas aligned to these values. On the point of exploring and implementing your own ideas, it requires a certain courage to do so. Thinking back to my own graduate experience, had I not developed the strength of heart to honor questions and claims held solely by me, such environments could have dampened my participation, and perhaps it did to a certain extent. Making a conjecture creates a personal connect almost immediately, because it acknowledges your most fundamental reaction to something before evolving it. A good friend of mine has 2 children. 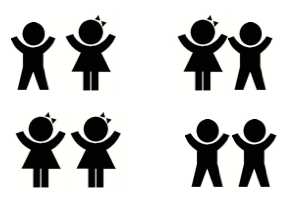 If one of them is a boy, what is the probability that the second is a boy as well? But what if we know additional information about when the one boy was born, should it make a difference? What if that boy was born on a Tuesday, does it change the probability of the second child being a boy as well? Another one that teachers and students have fervent responses to is — Are there more points or lines in the 2D space? The exploration of this seemingly simple question leads to meaningful insights about how we traditionally define a line and a point in the K-12 curriculum. If you haven’t played with these, after making and exploring your claims, feel free to check my recent post to confirm your findings. Empowering students to make and explore their conjectures allows them to voice what makes sense to them, and seek their own path to confirm or refine their intuition, even if they turn out to be wrong. In not so many words, it tells them that the canon of mathematics, is theirs too. And as you may have noticed, simple questions can often invite interesting and productive conjectures. 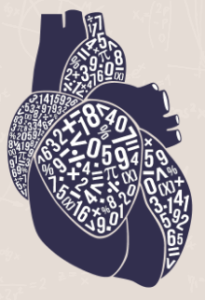 Both the heart and math are complex on their own, so the mathematical heart must be an order of magnitude higher in complexity. I begin this conception with these two inputs, with the understanding that there many other ways to form meaningful connections between math and the self. So I very much look forward to exploring extensions of this initial framework together. As you sit with this and think, hmm, that seems like a lot of extra time, I’d like to note that even a few such experiences in an academic year can give students a broader view of what it means to do math. Working in a large urban bureaucracy myself, I know the extent to which standardized tests highjack the schedules of our most needy students. 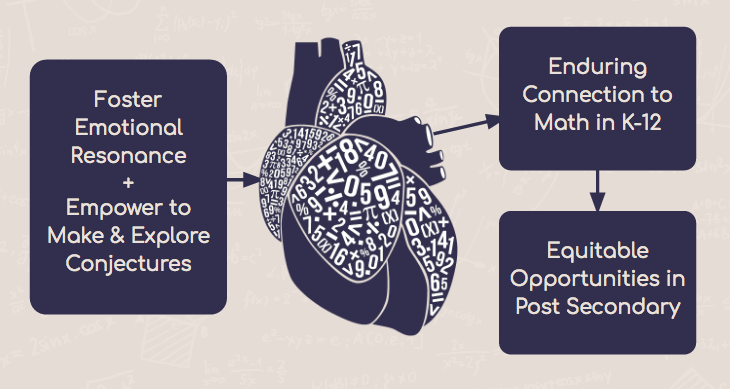 Despite these challenges, I invite you to expand the definition of math in the K-12 arena and help me to explore, add to and chronicle the impact of my conjecture — that offering experiences that foster emotional resonance with the study of math, while empowering students to make and explore conjectures that they generate — will give rise to more resilient connections and in turn lead to equitable opportunities in their post-secondary lives whether they wish to contribute to fields of abstract math, applied math, both or none. To close, my passionate entry point to this work was to support our under-served students who are breaking their generational barriers in STEM fields, similar to the women who raised me. But, in fact, all students should be afforded the right to build rich connections between the study of math and the various shapes and colors of their humanity. In turn, the world only stands to benefit from people who’ve learnt to use math from their hearts and not just their minds. What certainty does information buy you? During my Shadowcon talk, I invited participants to think about their fundamental reactions to problems, make their own conjectures, before seeking to confirm or refute them. I apologize for the delay, but here I include the solutions, and hope that you got a chance to play around with the questions before reading. If your friend has two children, and one of them is a boy, what are the odds the second one is a boy as well? Intuitively it “feels right” to react with, irrespective of what gender the first child is, the second child has a 50/50 chance of being a boy because these are independent events. But as my suspicious pause suggested, the extra knowledge about the first child does change up the odds a bit. Since my friend has two children, there are 4 total possible outcomes. Knowing that one child is a boy, cuts the number of possible outcomes down to 3. Of these three, only in one of them is the second child a boy as well. 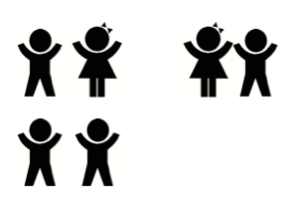 Therefore the probability of the second child being a boy, given we know that one of the children was a boy, is 1/3 (not ½). Imagine now that we have some additional information: the boy was born on a Tuesday. Does it change the probability of the second child being a boy from 1/3? As long as we know it’s a boy, why would the day he was born affect the odds of the second child? There are a total of 27 outcomes, out of which 13 pairs have two boys, with one of them born on a Tuesday. That extra information bumped us up about 15% from 1/3 to 13/27! What felt helpful about the opportunity to acknowledge and honor your intuitive response to the question before seeking its validity? Are there more lines or points? A few weeks ago, I facilitated a session at the Teachers Development Group Leadership Seminar to support teachers in creating conditions that naturally invite productive and interesting conjectures in secondary mathematics classrooms. Though much of intellectual progress in mathematics and the sciences has relied on our ability to question and/or extend conventional wisdom, students often feel bound by convention and find themselves pursuing others’ mathematical questions rather than their own. The process of making and exploring conjectures — claims and problems we pose for ourselves — affords students an environment to question, use and refute “established” knowledge as appropriate, and reason from fundamental principles rather than abstractions that may feel removed from personal experiences. For enduring change, shifting the culture for students requires a shift in collaborative teacher learning. So I posed the wonderment – to what extent are teachers being encouraged to make and test their mathematical questions such that they are afforded the opportunity to make and grow mathematics themselves? For participants in the session, the goal was to dip their toes into the world of making and testing conjectures by taking a closer look into the Functions domain they teach. I posed the following questions. Are there more lines than points in the 2D space? 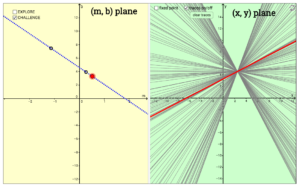 Plotted a line in the m-b plane (slope-y-intercept plane). Made a list/table of at least 5 points on this line. Since each of these points in the m-b plane represents a line in the x-y plane, they used the Desmos calculator to plot these lines. With noticings from these steps, they were able to think more deeply about their initial claims but no one arrived at an “answer” to the question they’d want to stand behind! **I didn’t provide the solution to give folks a bit more time to wrestle, but for those of you who’ve continue to ponder — here it is. Cardinality of the set of Points in 2D plane? –A point in the 2D in the Cartesian plane is defined by its x and y coordinates. –Since both x and y coordinates are numbers on the real number line, ℝ, this means that there are n(ℝ)2 possible points in the 2D plane (product of x and y). — Since both m and b coordinates are numbers on the real number line, ℝ, this means that there are n(ℝ)2 lines in the form y = mx + b in the 2D plane (again, product of m and b). — But not all lines are captured by the slope intercept form. There are vertical lines of the form x = r where r is also a number on the real number line. Therefore, the cardinality of vertical lines is n(ℝ). —> Putting this together, the total amount of lines in the 2D plane is n(ℝ)2 + n(ℝ). Ergo, the sets of lines, n(ℝ)2 + n(ℝ), and points, n(ℝ)2, are equal. 2. 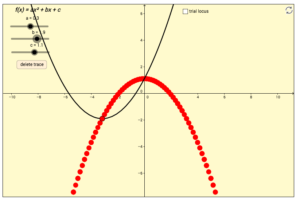 We know how varying the parameters ‘a’ and ‘c’ affect the form of the graph of a quadratic function, but what is the impact of varying the parameter ‘b’? What is the equation of the parabola that’s traced by the vertex of a quadratic function for fixed values of ‘a’ and ‘c’ while the parameter ‘b’ is varied? 3. What happens when you trace a square instead of a unit circle? What are the “trig” functions and identities that come out of this exercise?